We love wine. Really, who doesn’t? Red, white, sparkling, you name it. But, if you’re anything like us you probably don’t know a whole lot about it, aside from the fact that 1. it tastes pretty damn good and 2. it can turn a bad day good in a matter of one glass. Unfortunately though, your daily glass of vino is accompanied by a hefty dose of synthetic chemicals and pesticides. You know the ones? The pesticides that have you coughing up those extra few bucks on organic fruit at Whole Foods? Yeah, those. They’re also sprinkled over grapes during wine production, so “drinking responsibly” is no longer reserved solely for that time you threw up in your roommates purse. To help you out, we spent a really hard work day eco-wine tasting (not sorry). The overall verdict: yum. Alright ya’ll, this is the creme de la creme of eco bubbly. It basically tastes like a creamy pineapple butter cake - need I say more? This extra dry Prosecco is crafted with 100% certified organically grown grapes and cultivated without synthetic chemicals and fertilizers. Mionetto takes it a step further by using only recycled materials to craft and ship the bottle. It tastes bomb with white meats, fresh seafood, and risotto, but you can basically drink it with whatever you want. Easy peasy lemon squeezy. This wine is super light and easy to drink all year round. 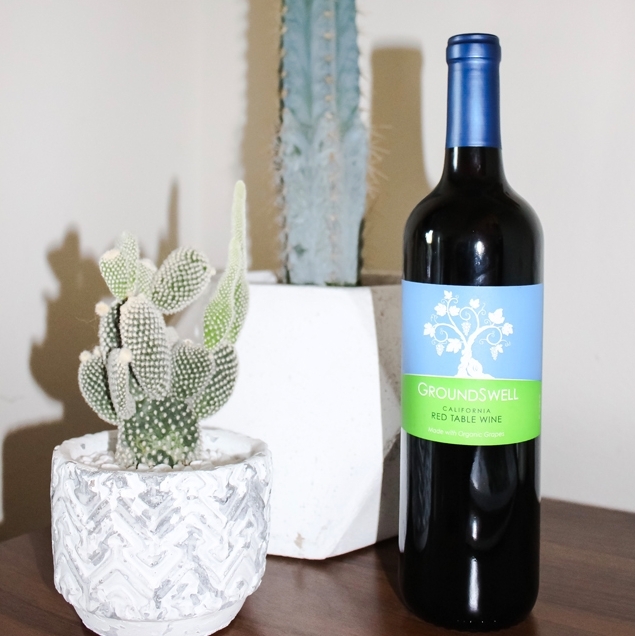 GroundSwell wines are literally made from the ground up, delivering a unique depth of flavor. They say no to the gross stuff, so you won’t find any artificial chemical fertilizers, pesticides, fungicides and herbicides - basically, no ‘cides. Their eco-friendly bottle is 30% lighter than traditional wine bottles, and their wine labels are produced from 100% post-consumer waste. By using less glass they’re able to reduce the carbon footprint of their packaging by up to 25%. Woo! You’ll find yummy notes of plums, berries, and toasty oak - the perfect companion for a nice evening of netflix and chill. This is fresh. REAL FRESH. Like a super tangy key lime pie. Bonterra vineyards have been farmed organically since 1987, long before organic products made their way to the mainstream market. I guess you could say they hit it first. Instead of spraying their vines with chemicals to ward of pests, they give sheep and chickens a place to roam free. When released in the vineyards, chickens eat the weeds and insects that can harm the vines, and their scratching and pecking naturally aerates the soil, which ultimately provides additional nutrients to the vines. December through March, around 2,000 sheep visit the vineyards, snacking on the cover crops and weeds from one vineyard to the next. They thrive on the rich organic greens as they “landscape” the vineyards, adding beneficial fertilizer to the soil as they graze. This wine is vibrant with hints of citrus, grapefruit, and crisp green apple. It’s also super refreshing. If you’re in SoCal and struggling to get through this insane heatwave, we suggest you go grab yourself a bottle. Stat. This wine is tasty and subtle. It’s not as bold as other rosés, and offers a really easy and light palette for drinking. Like the wines before it, Pot De Vin is crafted with only organic grapes. Definitely a good go-to for a hot beach day. Spruce it up with some muddled peach and strawberries for a sangria cocktail. Are we connoisseurs yet? I LOVE this wine. It’s from South America and they know how to do reds real good. It has that earthy-meets-fruity thing going on, combining crisp notes of red berry, with traces of tobacco and vanilla. Cono Sur certifiably farms without any chemical or synthetic products, and they use only natural fertilization techniques and resources like flowers, grass, geese and the introduction of beneficial insects into the vineyards. Oh, and its label is also made from recycled paper. Show up to Thanksgiving dinner with a bottle of this vino and you’ll shock ‘em all. Go on, put your feet up, and pour yourself a biiiig glass. You deserve it. *All wines can also be purchased from Whole Foods.